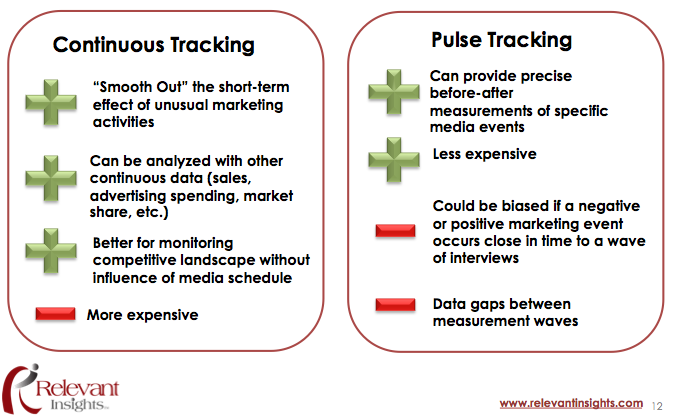 "Brand Tracking - Taking the Pulse On Your Brand." From the poll conducted during our presentation about 33% had a lot of experience with brand research, 29% had some general experience, and 38% had little or no experience but wanted to learn more about it. According the American Marketing Association a brand is “a name, term, sign, symbol or design, or combination of them intended to identify the goods and services of one seller or group of sellers and differentiate them from those of the competition." A brand is a perception of your company the products/services you provide to existing and potential clients. For customers it serves as as an identification or symbol of products and services to which customers can bond to or shun. For companies it's an opportunity to create, recreate, and track your image, increase visibility, and review trends on market share. In this presentation Michaela Mora focuses in one technique of Brand strategy research: Brand Tracking. Brand Tracking monitors health of the brand competitive landscape to allow for proper adjustments and provide information to facilitate marketers’ day-to-day decision making. This will offer insights to the effectiveness of various market campaigns. How often should you track your brand? 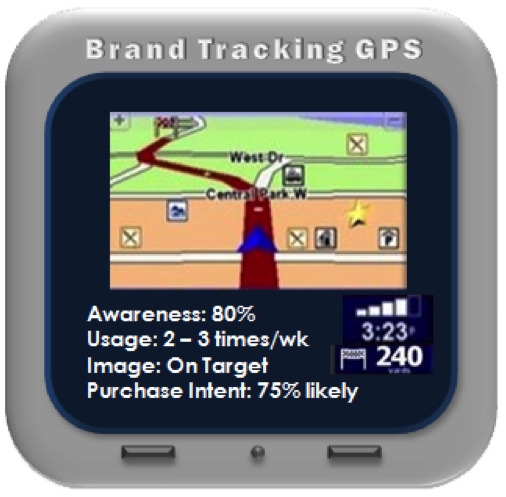 Generally it will depend on your budget, time-line, and goal from tracking your brand. It depends on the frequency of purchases, marketing campaigns, overall goal of specific products/services, competition, and how stable your current brand is. Brand is the formula for Brand Awareness? To measure the strength of your brand ask questions regarding relevancy and consistency of your brand. Example: "When I need to search something up on the internet I use Google. I 'Google' everything I want to look up." Factors that hinder brand recall include interference of other product information, time since last exposure, and the number and type of external retrieval cues. Brand Recognition : Brands stored in memory by consumers & respondents. Example Q:Which fast food restaurant features a golden arch? 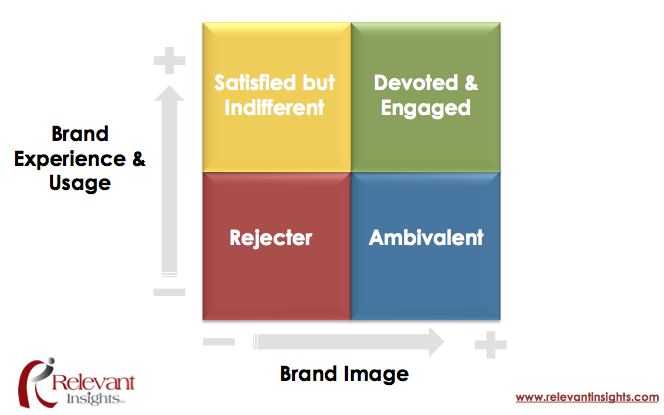 As see in the general boxes above, you can determine how your brand is doing based on the 4 boxes presented above. In an ideal world we want all of our clients to be in the green devoted and engaged box forever, but as new competition emerges, customer experience changes, and consumer perception change, it's imperative to devote time to create a brand strategy that keeps ahead of the game. 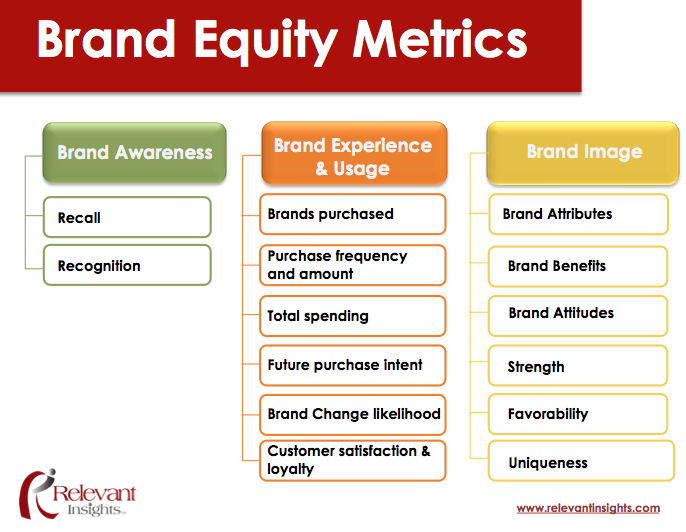 You need to access which metrics are you using to measure brand equity and correlate where these sources came from with the effectiveness of your current marketing activities. Brand Tracking - Taking The Pulse On Your Brandhttp://static.slidesharecdn.com/swf/ssplayer2.swf?doc=brandtracking-takingthepulseonyourbrand-101116122940-phpapp02&stripped_title=brand-tracking-taking-the-pulse-on-your-brand-5800960&userName=rinsightsView more presentations from Michaela Mora. View more presentations from Survey Analytics. Michaela Mora is the president of Relevant Insights, LLC (http://www.relevantinsights.com), and a seasoned market researcher with more than 20 years of experience in industries such online subscription services, software, entertainment, offline and online retailing, automotive, travel, hospitality, consumer packaged goods, non-profit, insurance, and beverage among others. Using an ever evolving toolbox which includes multivariate analysis techniques, conjoint analysis, MaxDiff, latent class segmentation, and TURF analysis among others, Michaela has been involved in many studies including brand tracking studies, concept testing, market segmentation, customer satisfaction, A&U, pricing research, copy testing, PR research and Web site optimization research. She helps clients with all aspects of a research project from design to field implementation, data analysis and reporting. Michaela holds a MS in Marketing Research from The University of Texas at Arlington, a MS in Marketing, Advertising and PR from Stockholm University, and a BS in Psychology from Havana University. She also holds a Professional Researcher Certification (PRC) at the Expert Level, issued by the Marketing Research Association (MRA).